I was in the Apple store, unsuccessfully trying to tear my son away from the latest Apple crack video software, when one of the Apple guys, those young computer geniuses, came and asked if he could help me. We got to talking, and it turns out he played the violin when he was younger. I showed him Violinist.com, and I happened to turn up a page on my blog in which I'd embedded Adam DeGraff's Sweet Child of Mine YouTube video. It's the tune that inspired the Rockin' Fiddle Challenge, in which more than a thousand violinists took the challenge to learn Adam's version of this Guns 'n' Roses song. "Whoa, what's that?" said the Apple guy. I told him, and he listened to the whole thing, start to finish, right there, in the middle of the Apple Store, saying, "Oh my God! Wow! Oh my God!" the whole time. Bedlam in the Apple Store! I said to him, "You're going to take up the violin again, aren't you?" "I may just have to!" he said. "Has he done other covers?" 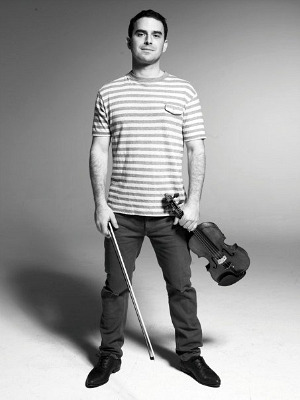 Adam has done other covers, along with violinist Russell Fallstad, who together make The Dueling Fiddlers. But their tunes are more than covers, more like explorations of popular music – explorations that can lead the listener from Bach into unchartered territory, can wander from Green Day into the Pachelbel Canon, or simply shine a little fiddle light on the different facets of a popular song. Just this month they released their new album, Rock Violin, with an eclectic mix of music that inspires them: Green Day, Coldplay, Lady Gaga, Ke$ha, Joan Jett, Queen, Bach, Led Zeppelin, AC/DC, Radiohead, "Love Story," and Dave Matthews. 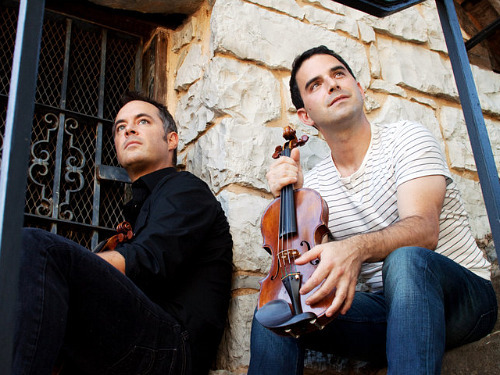 Both Adam and Russell are classically-trained violinists with music degrees from Northwestern University. Adam was concertmaster of the Richmond Symphony. Russell was the violist in the Fry Street Quartet and was a faculty member at Utah State University. Adam: I think that it all started because that's the kind of music that I've always liked. Even though I love classical music, I've always loved rock. When I was a kid, I kind of felt sad. I thought, this is a shame: I love rock music, but I play the violin. I'll never be a rock star. But what I came to realize is that rock 'n' roll is more of a state of mind than what instrument you play. I hadn't really ever met anybody who was doing (rock violin) really well until I met Alex DePue. He got me thinking. He did a cover of Smooth Criminal, and it's awesome. As amazing as Alex is, when I heard him play, I thought, you know, I think I can do that. I think I can do it in a way like me, like who I am. I didn't want to rely on mikes, amps, pickups or anything like that. So I started experimenting with the violin as an acoustic box that I could make sounds that I wanted to make: everything from wah-wah to distortion, to echo and reverb. Maybe I could make the sounds that I wanted to with my hands, with my bow, with my sounding point, with my pressure and with my speed. I even started getting into cross-tuning – taking my violin and tuning the strings to pitches that they are not normally tuned to. By doing that, I actually created a highung kind of sound. We do that in our Back In Black, and I do that in a couple of the other tunes. Laurie: Like scordatura rock 'n' roll. Adam: There you go! And if you're a classical violinist, it will mess with your head. You put your fingers down, and you expect a certain sound to come out. When you don't get that sound – that's when life gets strange. Laurie: How long ago did you start looking into this kind of thing? So I started listening to the piece. Instead of writing things down, I just jammed with the recording. Then I realized, I wasn't trying to get every note right, like a true cover. It was almost comical, that a violin, one solo, classical, un-miked, un-amped violin was going to take over all five parts. In a sense, it's a parody. That's what makes it interesting, I think. I wouldn't really want to hear a rock band play 'Sweet Child O' Mine' like it was Guns 'n' Roses. What makes this interesting to me, and perhaps to other people, is that all five parts are distilled into one violin part. I'm totally into it, I'm really rockin' the fiddle, instead of just very accurately reproducing all of the different parts. There are groups out there doing that, and they do it very well, and it sounds like a string quartet playing Guns 'n' Roses. I don't want to sound like a violin, I want to sound like Slash and Axl. Laurie: Or just sound like the song, basically. Adam: Exactly. It's been exciting to see people respond to that. I've had YouTube videos up forever, and this was the first one that ever got hit really hard. So I started writing other covers, arrangements. My next one was 'Stairway to Heaven.' I played it at live shows and people really liked it. I started doing some original tunes that were kind of Rock and Bluesy, and I put a solo show together. I had a lot of fun with the solo show. So he came out, and he had never improvised before. About 90 percent of what we do is improvising. We have a basic rock tune and then we just kind of go crazy with it. So he said, 'Okay, let's rehearse,' and I said, 'Okay let's go to the coffee shop,' and he said, 'What do you mean, let's go to the coffee shop?' and I said, 'Well, if we're going to improvise, we've got to do it in front of people, we can't improvise in a vacuum, you need to see how it feels...' His classical uptightness kind of came through, I could tell how nervous he was! But he totally just whaled on it and was amazing, and from that point on, we've just been taking these rock tunes that we love. The fun thing about them is that they mash up: we do Dave Matthews into Guns 'n' Roses, or Green Day into Coldplay, into Pachelbel Canon. There are no rules, whatsoever; it's whatever pops out right then, right there. It's so fun. It's been interesting, too, because when you have two violinists, you have two lead voices. One of us is playing rhythm guitar, one of us is playing lead vocals, one of us is playing bass, one of us is playing drums – all on the violin, or viola. Russell plays viola, also, he was actually a violist in the Fry Street Quartet. Laurie: Did it help to have a classical background? Adam: Oh, absolutely. If you're a good classical player, you can do anything you want on the violin, or you can figure out anything you want on the violin. You're already completely set up for it. There are some alternative techniques that you can learn; you can really augment your playing. For example: chops. For my money, Tracy Silverman is the number one master of the chop. Totally amazing. Darol Anger and Alex DePue also have a great chop. But what's so cool, when you're classically trained, you can look at other people's chops and say, 'I like that, but I want mine to sound like this.' You have the ability and the canvas to do whatever you want. I've been experimenting a lot with other effects. For example: a slightly different vibrato that is not anchored to the violin, it moves a little more, a little like a whammy bar. And then mixing that with a slightly ponticello sound with the bow – this creates almost a distortion. I remember the first time I played it at a concert, I did a show at 'Carnegie Hall' in West Virginia -- there's a non-New York Carnegie Hall. I had a really uptight audience there, and I laid into 'Sweet Child O' Mine.' When I got to the big guitar solo I laid in this thick, heavy distortion, and they just started laughing – audible, open-mouthed, jaw-on-the-floor laughter. They said, 'Oh my God, that sounds like an electric guitar!' (laughs) It was so fun! Laurie: Did you do any composing before this? Adam: I hadn't done a lot of composing, and I think the reason was that I hadn't found my medium. My voice was still very conservative and classical. But now I'm writing constantly. Laurie: You've opened up the box. Adam: I have. My wife is frequently asking me, 'What are you doing right now, what are you thinking?' And the music is always on. I can't seem to turn it off. I don't want to, but sometimes when I'm trying to sleep, it would be nice! It's a constant sound in my head. Laurie: What was your background, how old were you when you started playing the violin? Adam: Straight classical. I started at four, with Suzuki, in Chicago, North side. I'm glad that I did because the ear training has come in so handy. Very soon I started doing extra stuff: little improv things. I remember telling my teacher, Milton Goldberg, that I wanted to do rock, and he laughed. But he set me up with Joe Golan who was the principal second violinist of the Chicago Symphony. I give a ton of credit to my teacher, who was not at all insecure. He said, 'Go for it.' Joe started teaching me to improv. The first song we did was 'Summertime' by Gershwin, and it opened up a can of worms, I couldn't stop improv-ing! He set me up with a bunch of gig guys in downtown Chicago, the guys who booked for the Four Seasons and the Drake Hotel. They started calling me at age 14 to come and do strolling violin gigs. I was playing all these pieces that I'd never heard before, all these Gershwin and Porter tunes that I truly didn't know. It was perfect because since I didn't know them, I had to improvise. While all my friends were bagging groceries for $3.25 an hour, I was making $75-$100 a night. Laurie: You were strolling at the age of 14? Adam: It was hilarious. My mom bought a tuxedo, and she would drive me 25 minutes downtown, drop me off at these hotels, and there'd be a bunch of old, smoking violinists, standing outside, and I was the squeaky-clean little conservative kid. I learned on the job, and I had so much fun doing it. It largely paid my way through college; I was a first-call for a lot of these bands. I learned to improvise, and I was kind of fearless. Laurie: You did this all through Northwestern? Adam: I did. And I played in Civic Orchestra, I was co-concertmaster my last year there. That's when I decided that I wanted to become a concertmaster. So after Northwestern I went to Rice University and studied with probably the finest concertmaster, J. Richard Hackman did. He studied the orchestra as a part of a Mellon grant, and he interviewed me extensively. He was very clear with me that he didn't think that I had the personality type to play in an orchestra, that I was more entrepreneurial and creative. Not to say that creative people couldn't be in an orchestra, but he really saw that the combination of my entrepreneurial spirit and my creativity as a calling card for something else. He said, 'Go be a soloist, or a chamber musician, get some control over your life.' So I did. I just kind of jumped ship, and everyone was shocked that I left. I loved the mountains, so I bought a farm in West Virginia with my wife. We moved to West Virginia and I started fiddling a little more. I bumped into a retired pianist from Jackson Hole, Wyoming, who had moved here, same time same place. We ended up hitting it off and improvising together. We created a group called Pianafiddle, which started slowly and then caught the attention of some big touring agencies in Nashville. Overnight it went from being a 20, 30-concert show a year to a 200-concert. We had to buy a tour bus – it was the weirdest thing in the world for this former classical violinist, to own the tour bus. And I drove it! Laurie: What an adventure! And now it's evolved into The Dueling Fiddlers. Are you guys going to be touring in the near future? Adam: This particular group is a little more project-based. I heard a quote, somebody said if you do the same thing and expect a different result, then what is that? Crazy! Adam: That quote really got me thinking, about what I wanted. I wanted to take a different approach with this project and meld the performing arts center–type gigs with a little bit of the rock 'n' roll approach, which is clubs; and YouTube, and CDs and videos. Laurie: Why did you want to let people play your 'Sweet Child 'O' Mine'? Adam: I didn't. They did! I thought, at the beginning, that I would just play it myself. When it hit about 1,000 e-mails – I'm not exaggerating, I mean literally 1,000 e-mails – saying, 'Will you send me the sheet music?' I said, 'You know what? Sharing is a good thing. I don't need to keep this to myself, I want to share.' Then it took me a very, very long time to figure out how I was going to actually share it in a way that felt good to me. I realized that a lot of the people who were interested in doing this might not have the technical ability to pick up the music and start playing. The piece itself is harder than any Paganini Caprice I've ever played; it's very challenging. At the same time, I have a lot of experience teaching. I thought, maybe I can combine the two. Instead of just passing out the music and letting them fail, I could pass the music out in a controlled way, with my fingerings, my bowings and my kind of tutoring along the way. I could show them how I think it can be done and should be done. So I created the Rockin' Fiddle Challenge. I wanted to inspire them, so I talked to Shar, and said, 'Do you want to donate $20,000 worth of gift certificates?' And they said, 'Absolutely!' Then I talked to one of my favorite modern violin makers, Jan Van Rooyen, and asked, 'Do you want to donate a violin?' And he said, 'Absolutely!' Everyone was just so excited to be a part of it. This challenge has been up and running since June, and we have 1,400 people entered from all over the world. So that feels great. I love the fact that people are so excited about this. Earlier in the summer, I posted a new video, and one kid stayed up all night learning it so he could be the first one to upload a video this morning. I'm just so honored that people are so excited. A couple people have said, do you have any other pieces? Do I have other pieces! So I went ahead and copyrighted the term 'Rockin' Fiddle Challenge' and I plan to make it a permanent part of The Dueling Fiddlers' show. Laurie: How are you going to pick the winner? Is it going to be the "best" one? Adam: I'm devising a point system. They'll get points for their hits on YouTube, they'll get points for helping other people along the way, because I want to create not just a selfish competition, I want it to be a challenge, where they're challenging themselves and then helping other people. I'm doing it all on Facebook, which makes is so easy to comment and and repost and kind of cheer each other on. I want to foster this community of people. Ultimately I'm going to make the points a bonus at the end, but I'm going to pick the 10 finest examples –maybe it will be 20 – then I'm going to deliver those links to a panel of judges and let them watch and vote and score their videos and then let them choose the final video. So I've got some really great players who have been volunteering. I'm thinking I'm going to run the educational part through the fall, and then have the final upload be in January. Adam: I think that there's a lack of jobs and there's kind of a poverty mentality among musicians sometimes. What we don't realize is how rich we are, just having this in our lives. That wealth goes way beyond what we're able to do – you're changing people's lives by playing music. The more musicians, the better, if you ask me. The more excitement, the better. The more you help people, the better you get, and that's just something I've learned over the years. My friends inspire me, and I hope to inspire my friends. It's a great community to be a part of. I love these guys! Hoping for a book with their music arrangements someday! I read this blog post a few days ago, friended The Dueling Fiddlers on Facebook, and then all of a sudden discovered that they were in Austin! I made it out to their last show Friday night and had a blast :) Best timing ever, and thank you for showcasing TDF!